(MIAMI, FL) — Despite a national U.S. housing crisis still in play, the Miami condo boom is back with a vengeance On February 14, 2012, another groundbreaking ceremony was held for the newly announced Oceana, the first U.S. real estate development of Argentina-based developer Consultatio. 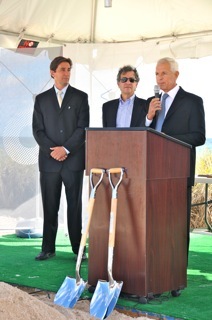 Marcos Corti-Maderna of Consultatio Key Biscayne, LLC, Key Biscayne Mayor Frank Caplan and Eduardo Constantini of Consultatio Key Biscayne, LLC at the groundbreaking ceremony for Oceana Key Biscayne. Oceana will be an exclusive 142 condominium development with 12 luxury Villas adjacent, located on the last oceanfront site available on Key Biscayne. This will be a state of the art project; Units will range from 1800 SF to 7500 SF, with a very low density (154 units on a 10.3 acres site). The new twin-tower Key Biscayne condo project is being touted by some local real estate brokers as the most exclusive new residential project in Miami since the condo boom five years prior. 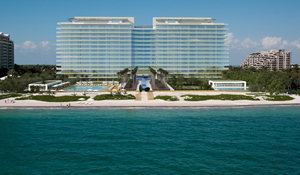 Oceana is going to be built on the site of the former Sonesta Hotel, which was one of the first hotels in Key Biscayne. The 10.3 acre oceanfront site was acquired by Consultatio in September 2009 for $80 million, and the estimated total project cost will be over $250 million USD. Due to the lack of land availability on Key Biscayne, there has not been any new real state development in the past 12 years. Consultatio has hired Coastal Construction as their contractor, and continues working with their architectural firm Arquitectonica on finalizing project construction drawings. The developer plans to start selling the 154 condo units in the months ahead and is currently working on setting up their in-house sales team. Key Biscayne is considered one of the most exclusive areas in Miami and has one of the highest incomes per capita in the United States. Key Biscayne is also home to many internationally prominent residents, including A-list actor Andy Garcia, Miami Dolphin football great Nick Buoniconti and Latin American television celebrity El Gordo of El Gordo y La Flaca. Consultatio is an experienced real estate developer from Argentina, with 30 years of experience developing large-scale master planned communities, commercial properties, and residential towers in high end international markets like Nordelta, Puertos del Lago, Las Garzas (Uruguay). The company is under the direction of its’ major share holder, president and CEO Eduardo F. Costantini, a prominent Argentinean businessman.